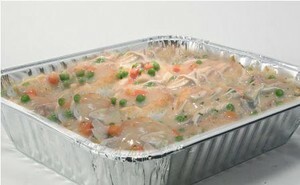 Combine 2 quarts (8 cups) Savory Poultry Gravy, thyme, chicken and thawed peas and carrots. Stir to mix well. Set aside. Split each biscuit in half and place bottom halves of the biscuits in two 2½” deep half pans. Pour the sauce mixture over the biscuit bottoms, dividing the sauce evenly between the two pans. Place top halves of biscuits over the sauce mixture (top sides up). NOTE: Savory Poultry Gravy Mix yields 1 gallon of gravy. This recipe uses 2 quarts (8 cups). Store remainder tightly covered in refrigerator for up to 5 days.